Please read before registering or purchasing Embroidery Designs. --Original Buyer can stitch GBG designs onto gifts and items to sale. There is no limit to the quantity of "sew outs" sold. Please give credit with your "sale" to the GBG design you used. A little notation stating you used a GoodiesByGail Design would be all that is necessary. --These are for the Original Buyer's sewing habits only. .
--The designs files, photos and GBG Artwork remains the property of GBG. --You may change color, rotation and size of "sew out". You can NOT share, copy, give, trade, upload, re-bundle, email, Sale or Re-Sale or transfer and distribute any of the GBG designs files. Ignorance is not an excuse in the eyes of the law, misery loves company so of course the giver is going to tell you "it's ok", just to get you in their boat. This also applies to Gigatribe, Dropbox and other Peer to Peer file sharing software/websites. Remember all this applies to Free designs also. Some internet providers flag messages from us as SPAM. You should get 1. a "Welcome" email when you first register for an account and from then on the only email you should receive are 2. Order Confirmations when you make a purchase on the website. It is very rare that any other type of email be sent to you from the website. You may want to have these two email addresses as not Spam in your email software and or with your ISP. We do not click on Spam Controller emails either. Please take note if you sign up with false information and the welcome email is bounced back to me, your account will be marked for deletion. If you feel you did use the correct email and your account has been mistakenly deleted you may sign back up but check the spelling of your email address carefully, it may have been misspelled the first time causing the bounced back emails. At GoodiesByGail, Gail takes the most care possible in protecting your privacy. This site does have a SSL Certificate installed. Gail can not guarantee complete security on stored information. The most important security pages are Registration, Account, Login and Payment. Any information you send to website will not be shared or sold to others. Your information you supply at registration can be updated via your "My Account" page. Make sure your information is up to date so there is less of a chance of a delivery delay. You may contact Gail if you would like to cancel your account. All your information will be deleted from the database. GoodiesByGail offers 2 shipping methods. Most purchases are direct downloaded once payment has been received. Regular mail for shipped items. Shipping is calculated through checkout. Direct downloads will show up as a link right after payment is made, also it will appear under your order history in "(your name)'s Account". You will have unlimited days to make up to 5 downloads per design purchased. Downloads become available within minutes of paying with Paypal. Right after payment the browser redirects you back to the website where you scroll down and there are your files to download. Downloads expire within 3 days of purchase. If for some reason after payment your are not brought back to the website you can find your order in your Account History. DO NOT FORGET TO DOWNLOAD YOUR PURCHASES! Gail is NOT reponsible for you forgetting to download your purchase. After Free Designs are downloaded, the order with a zero balance will be deleted from the website to preserve database space. As with all digital media, all sales are final if it is shown that the design file has been downloaded at least once then no refund. If within a reasonable time frame something goes awry, we have all had a computer crashes at some point, just contact Gail and see if she can reset your downloads. Steps have been taken to prevent duplicate purchase. There is no need to have a dispute over purchases. Just contact us and we will work with you as long as you contact her within reasonable timing. Take note that using the search box to locate Freebies is a waste of time. Typing in "Free, Samples, Freebies" or any other forms of those will not produce the results your looking for. If your looking for something else please check your spelling if you do not get the results your looking for or try a different term for the same thing. We have a large variety of designs so being as specific as possible will get you closer to the results. ex. 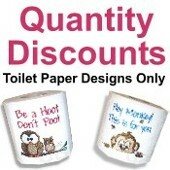 Don't search "Toilet Paper" there are over 300 tp designs, maybe try "birthday Toilet Paper" instead. If a member has commited Fraud and Copyright violations it is Gail's right as owner to refuse or delete any account. Your IP address is logged so that password shareing is detected. Gail has the right to verify the accuracy of account information. You may receive an email inquiring about the information that was provided. All information needs to be accurate and up to date so you receive the best possible service from GoodiesByGail.